Pen-and-ink and wash drawing of a sculpture of a guardian figure (dvarapala), dancing Shiva and Mahishasura Mardini from Cave I, Badami, by an Indian draftsman, dated 1853.
the town. Around the south fort there are four rock-cut cave temples. Cave I is the earliest of the rock cut caves of Badami and belongs to the late sixth century. It consists of a large columned hall (mandapa) and a small square sanctuary. The column shafts are incised with jewel and garland motifs and miniature medallions containing figures. Large sculpture panels in the porch depict Harihara with Lakshmi, Garuda, Parvati and Nandi (left) and Shiva with Nandi (right). 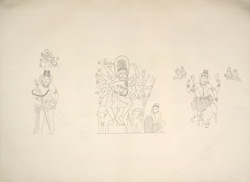 The figures on the top left in the drawing represent Shiva and Parvati on Nandi. Below this group there is a guardian figure (dvarapala). The central figure in the drawing represents the vigorous sculpture of the sixteen-armed Nataraja, the dancing Shiva, carved on the rock face projecting from the side of the rock facade. The figure to the right depicts Mahishasuramardini, the goddess Durga killing the buffalo-headed demon.